The Nebraska volleyball team wrapped up the regular season with its eighth win a row, defeating Maryland 25-13, 25-10, 25-18 in front of a crowd of 8,139 on Senior Night at the Bob Devaney Sports Center on Saturday. The sixth-ranked Huskers finished the regular season at 24-6 overall and 15-5 in the Big Ten, which will earn them a tie for third in the conference standings. Nebraska dominated the match against Maryland from start to finish, never trailing at any point. Mikaela Foecke had another outstanding match on her senior night, posting 16 kills on .577 hitting with seven digs and two blocks. The All-American outside hitter moved within 18 kills of passing Jordan Larson for fifth place on Nebraska’s all-time career kills list. Lauren Stivrins added eight kills and six blocks, and Lexi Sun contributed six kills and nine digs. The Huskers hit .414, their third straight match hitting better than .350. Nicklin Hames coordinated the efficient night with 32 assists and seven digs. Nebraska held Maryland to a .021 hitting percentage, the 13th time a Nebraska opponent has hit lower than .100 this season. Callie Schwarzenbach had five kills and two blocks, moving within one block of tying Tracy Stalls for the most blocks by a Husker freshman in a season (160). Capri Davis had four kills on four swings, and Jazz Sweet tallied four kills and three blocks. Nebraska had a 9-7 edge in blocks, a 5-2 edge in aces, and a 48-29 advantage in digs. Senior libero Kenzie Maloney had 11 digs and three aces in her final regular-season match as a Husker, and Megan Miller added eight digs and an ace. Erika Pritchard led Maryland (18-14, 9-11 Big Ten) with seven kills but on .115 hitting. Set 1: The Huskers came out on fire with four kills on seven swings and a pair of blocks to take a 7-2 lead. Foecke terminated back-to-back rallies to make it 10-4 Huskers and force a Maryland timeout. The timeout did little to slow the Huskers, however, as Hames and Foecke added kills around a Maryland hitting error for a 13-4 Husker lead. Maryland cut it to seven at 14-7, but the Huskers scored a 6-2 run to go up by 11, 20-9. Sun, Davis, Foecke and Schwarzenbach all had kills during that stretch. Nebraska earned the 25-13 win, hitting .500 and getting seven kills from Foecke on eight swings. Set 2: Nebraska picked up where it left off, blitzing to an 11-1 lead with three kills by Sweet and two aces by Maloney. 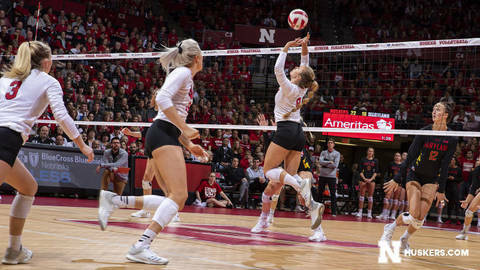 Stivrins and Foecke also added the Huskers’ fifth block of the match, and Maryland used both of its timeouts before the Huskers hit 10 points. Maryland would get no closer than nine points the rest of the way, as Nebraska took a 2-0 lead with a 25-10 win. The Huskers out-performed their first set hitting percentage with a .542 clip in set two. Stivrins had four kills, and Sweet and Schwarzenbach each had three. Set 3: Nebraska pulled ahead 9-4 after a 3-0 spurt. Foecke had three more kills to ignite the Huskers, and Stivrins had a kill and a solo block. Maryland pulled within 15-13 after an ace trickled over the top of the net, but a service error out of a timeout gave the Huskers sideout and sparked a 5-0 Husker run, as a Stivrins solo block and Maloney’s third ace made it 20-13 Big Red. Brooke Smith checked in at setter for the Huskers and set her fellow senior Foecke for her 16th kill, and Stivrins earned match point at 24-18 before NU won 25-18 to sweep the match. Up Next: The NCAA Tournament Selection Show will take place on Sunday at 7:30 p.m. and will be televised on ESPNU. Should the Huskers be selected as one of the top 16 seeds, they would host the first and seconds rounds next weekend at the Bob Devaney Sports Center. There are no tickets available for the potential first and second rounds in Lincoln, but if there are any visiting team ticket returns, they would go on sale Wednesday at 10 a.m. Those could be purchased through Huskers.com/tickets, by calling 402-472-3111 or in person at the Nebraska Athletic Ticket Office.